Our Valentine’s Day card maker is the perfect way to make your loved one smile. Use our Valentine’s Day card maker to create the perfect Valentine's Day card for your partner, family members or even your best friends. For a great surprise, or if you can’t be together on February 14th, send your customized online Valentine's Day card by email or social media. For a more romantic approach, use our Valentine’s Day eCard maker to print a paper copy and deliver it up close and personal. Valentine’s Day card maker provides a range of designs for every kind of affection. All you need to do is find the one that matches your taste and evokes just the right feeling. Old or young, classy or corny, our wide selection of free Valentine’s Day card templates is sure to be a hit. Once you have found the ideal online Valentine’s Day card template, it’s personalization time! 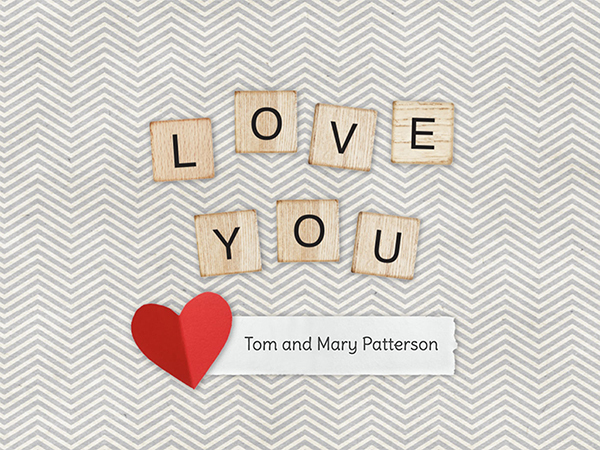 Add the perfect photo and a thoughtful message using the online Valentine’s Day card maker. You can adapt the card down to the smallest detail. See below exactly how easy it is. Scroll through our wide choice of free Valentine’s Day card templates, and find one that appeals to you most. Click it and then click “Personalize”. Find out why taking all those cute selfies was totally worthwhile when you use our Valentine’s Day eCard maker. You can choose any image you like from your phone, social media account, and computer when building your free Valentine’s Day ecard. Simply click “Add More Photos”. The Smilebox Valentine’s Day card maker enables you to change virtually every part of your creation. You can switch the main message and photo, as well as the fonts, minor text, and template color with just a few clicks. Valentine’s Day eCard maker gives you many options for sharing your free Valentine’s Day card. We have free printable Valentine’s Day cards that you can easily print at home, you can also email it, post it on social media, or save it on your computer (always recommended). Smilebox has built its Valentine’s Day eCard maker with busy people in mind. Customization actions can all be done from one screen and by using simple buttons plus drag and drop functions. If you are pressed for time – maybe because you’re gift hunting – you can customize and share an online Valentine’s Day card in mere minutes. No one will ever know that it took you no time at all to render a personalized keepsake using our Valentine’s Day card maker. Don’t forget to tell your friends about the online Valentine’s Day card maker – as long as they can keep a secret. The online Valentine’s Day card maker from Smilebox is more than just a convenient way to say “I love you”. It’s also really fun to use. With the Valentine’s Day eCard maker, you can experiment with every look in the book without any technical knowledge whatsoever. You might also get a kick out of our large free Valentine’s Day card selection, which often borders on hilarity. Moreover, we provide lots more beyond our online Valentine’s Day card maker. We have card makers for pretty much every day, and each delivers the fun and choice of our Valentine’s Day eCard maker. You might just fall in love with all of them!